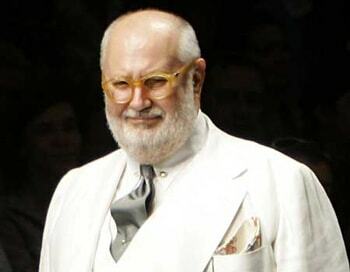 Gianfranco Ferré (August 15, 1944 – June 17, 2007) was a fashion designer also known as "the architect of fashion" for his background and his original attitude toward creating fashion design. Born in Legnano, Italy, he received a degree in architecture in 1969 at the Politecnico di Milano university. In 1983, he joined Domus Academy as founding Professor of the Department of Fashion Design. Ferré began his fashion career in 1970 by designing accessories, then worked as a raincoat designer in 1972-74. He started his own company Baila in 1974 and launched his signature collection for women in 1978. His first men's collection appeared in 1982, followed in 1986 by his first couture collection in Rome. Ferré became Stylistic Director of Christian Dior in Paris in 1989, when he was chosen by owner Bernard Arnault to replace Marc Bohan. In 1996, it was announced that Ferré would end his engagement with Dior with the Spring 1997 collection for the label. His own label is more relaxed and pared-down than Dior. Sophisticated white shirts have become the symbol of his personal signature in fashion design. Apparel Search presents Gianfranco Ferré profiles. Apparel Search guide to Gianfranco Ferré Profiles photos, Gianfranco Ferré Profiles videos, Gianfranco Ferré Profiles news, Gianfranco Ferré Profiles blog posts and more... If you are interested in fashion and style, you will be interested in Gianfranco Ferré Profiles. We hope that you have enjoyed learning about Gianfranco Ferré profiles. Did you want to see more from Gianfranco? If yes, check the designer links below. Do you like Gianfranco Ferré Profiles?